While it can be fun to toast, like, comment and rage against your friends when they check in their latest beer find, sometimes you just want your beer. I know for me, when I’m in Total Wine, I’m more overwhelmed than a toddler roaming the aisles of a big box toy store. I suddenly don’t remember what I have, what I’ve had or what I’d like to have. I just find myself grasping at labels and names that sound vaguely familiar. “There’s an app for that,” you may say. Then I’ll say “Yeah, have you tried to use your data plan in a big box beer store?” There’s a whole bunch of “no service,” and very little actual data being transferred. I’ve tried making notepad documents, but there’s no way to sort, and typing long/unusual names is a pain! He’s created an app called Beer Brains. The data stores locally on your device, so even if you have no service, you can still see your beer inventory. The only time you need internet service is when you’re searching for new beers. 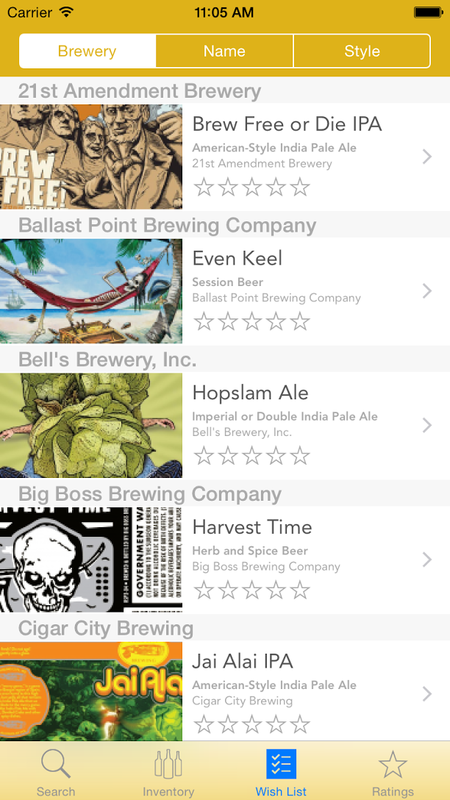 The app lets you categorize your inventory, create a wish list, and rate beers. If you want to indicate to yourself that you’ve already consumed a particular beer, then rate it. That will move it to the “ratings” view. The best part of the app? It reads bar codes! No matter how many times I hold my phone up to a beer, the notepad program is not going to read a bar code. The information is sourced from a third-party database (unambiguously called BreweryDB), which in turns gets its information from its own administrators and community. You can submit items for approval at their website. Per Justin, the database also distinguishes different years for certain brews. I asked Justin if the app lets you indicate whether you consumed the brew in a bottle, can, or on tap, but he said not exactly. Those aren’t categories you can choose, but there is a note section for each entry, and you can notate this for your reference. Right now the app is intended to be a reference for each individual. There is no account to log into, so there aren’t “friends” to approve, or people to follow. In the future he might add some “light sharing” capabilities: sharing wish lists and recommendations. He might also include average ratings from popular beer sites. He said there isn’t a limit to how many beers you can list (well, unless you have a tiny, tiny hard drive). The only limit is in searching. The cap on returns is 50, so if you search for “ale” you ain’t gonna get all the items. Beer Brains is free (ad-supported) in the Apple app store. Eventually he’d like to offer a paid ad-free service. If there’s enough interest in an Android version, he said that he would make one. For the record, I’m on Android! Most information comes from a written interview with Justin, but some of it comes from Google Plus. You may send any suggestions, comments or questions to Justin.